This buffet is known for having excellent food for a low price, including Asian, Italian, authentic Mexican and a variety of American fare. Everyone can enjoy dessert, since there is a large variety including options for diabetics. This buffet is known for having excellent food for a low price, including Asian, Italian, authentic Mexican and a variety of American fare. Everyone can enjoy dessert, since there is a variety including options for diabetics. 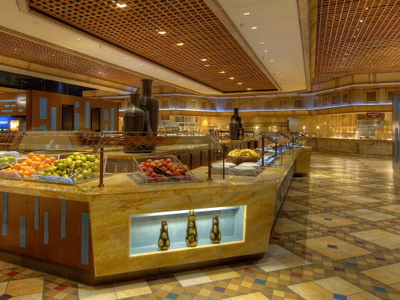 There are several discounts offered, such as a pass to eat all day at the Excalibur and Luxor buffets for one price. Those who purchase the combo pass can also drink unlimited wine or beer for a fixed rate. There is a 30 foot salad bar, a pizza station, a carving station and an omelet bar. Breakfast – 7:00 a.m. to 11:00 a.m. Lunch – 11:00 a.m. to 3:00 p.m. This buffet is terrible. Don’t waste your money. The last time I stayed in LV I stayed at Excalibur and b/c it’s so close to Luxor I decided to eat at More Buffet and deeply regretted it. I had dinner there and expected MORE! The selection was GREAT but there wasn’t one thing that I particularly cared for and I’m not a picky eater at all. This is one of the cheaper buffets in LV and ya get what ya pay for (maybe a little less). I know that it’s easy to mess up dinner-type meals so on my next visit to Vegas I stayed at Luxor and naturally, for convenience I wanted to eat there also…..so I tried the breakfast buffet and couldn’t have been more disappointed. If you want good food, it’s best to just pay a little more.